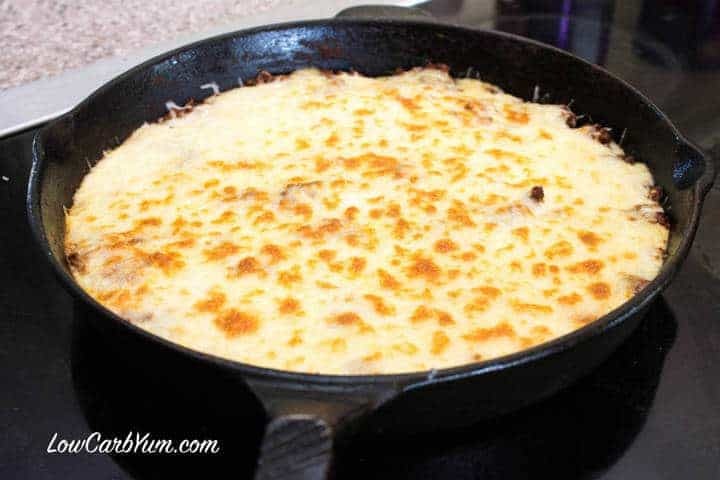 Have you ever tried a skillet moussaka recipe? 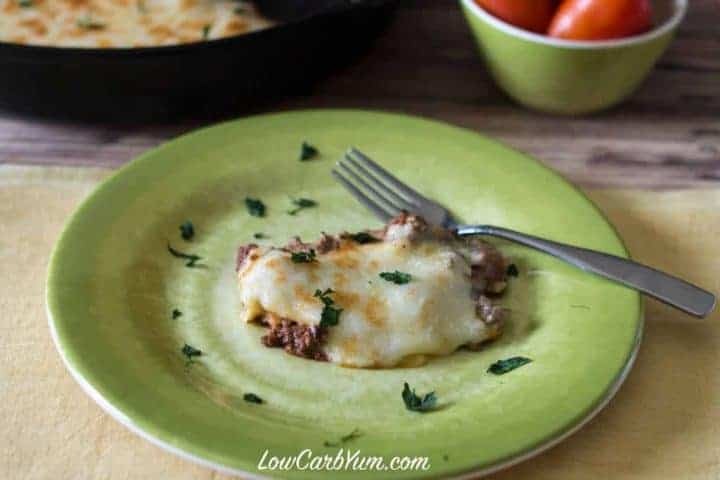 If you prefer cooking on the stove, try this easy low carb gluten free moussaka in a skillet for dinner. We have one eggplant plant in the garden that is loaded with fruit and I picked the first one the other day. It seemed rather long and slender, but it must be the particular variety. 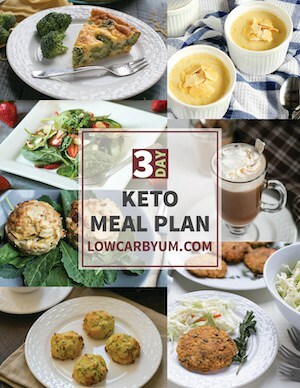 Although eggplant is a terrific low carb vegetable, I don’t buy it as often as I should. Moussaka is one of my most favorite dishes with eggplant. I usually make it as a casserole in the oven, but wanted to try a skillet moussaka recipe instead this time. My husband never pays much attention to the labels when buying plants for the garden. 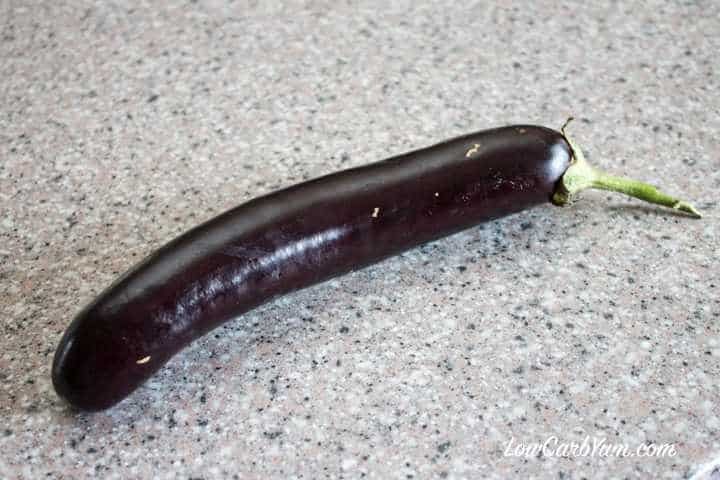 I was curious about the type of eggplants these are. After a quick internet search, it looks like we have an Asian variety that lends itself well to Eastern dishes. I may try these eggplants in a low carb Asian stir fry. No reason why a Chinese or Japanese eggplant can’t be used to make moussaka, right? Well, that’s what I’m thinking because I’ve been craving some good Greek food lately. My first taste of moussaka was actually on pizza and not the casserole. Growing up, there was a small pizza restaurant within walking distance to our house and I was very fond of their moussaka pizza. I’m not sure if they used beef or lamb, but the seasoning was amazing. I used a blend of cinnamon, ginger, and allspice to season the meat in this skillet moussaka recipe. I think a dash of cayenne or crushed red pepper would have been good additions too. I’ll have to remember that next time. Since the eggplant was so slender, I ended up dicing it pretty small. After peeling, I sliced and then quartered the slices. This was a good size that didn’t take long to become tender. 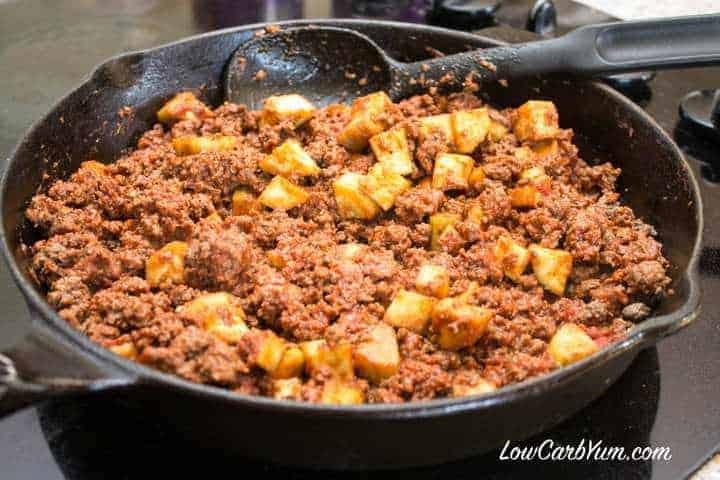 Although beef or lamb is typically used in moussaka, we have an abundance of ground venison from hunting season so that’s what I used. I know exactly where this meat comes from and it’s cheaper than any comparable meat I could purchase. I watered down a can of tomato paste since I didn’t have tomato sauce on hand. 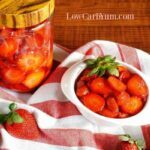 You really need to be careful when buying canned tomato sauce because it often contains sugar. Reading labels is a necessary habit if you are diabetic or following the low carb lifestyle. Since I cut up the eggplant so small, it didn’t take long at all for the pieces to soften. I’d say it was less than 10 minutes of cooking time. I made a really simple Bechamel sauce with a butter and almond milk base. 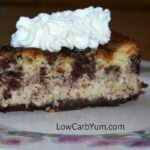 Since you can’t add any flour for low carb gluten free, I added a touch of xanthan gum. Totally optional! I just dumped the white sauce on top of the meat mixture. It was fairly thin so it spread out nicely in the pan. Then, I topped it off with some grated cheese. Any suitable cheese works. I opted for Monterey Jack. I wanted a nice browned top, so I put the skillet under the broiler for about 3 minutes. You don’t have to do this if you want to keep the oven off. You can just melt the cheese on the stove top by covering the skillet with a lid. 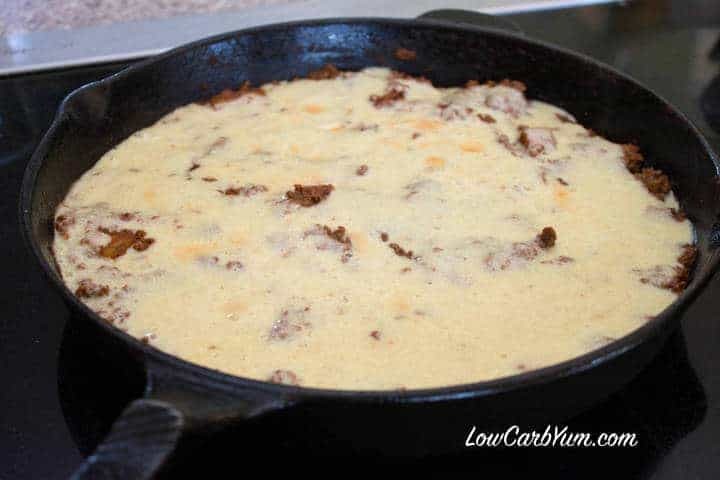 This skillet moussaka recipe is another great low carb ground beef recipe that I can add to my collection. 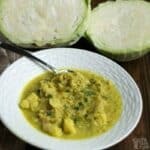 It’s also a fairly inexpensive meal to make if you are on a budget. It’s even cheaper if you grow your own eggplant in the backyard! 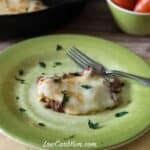 Have you ever tried a skillet moussaka recipe? 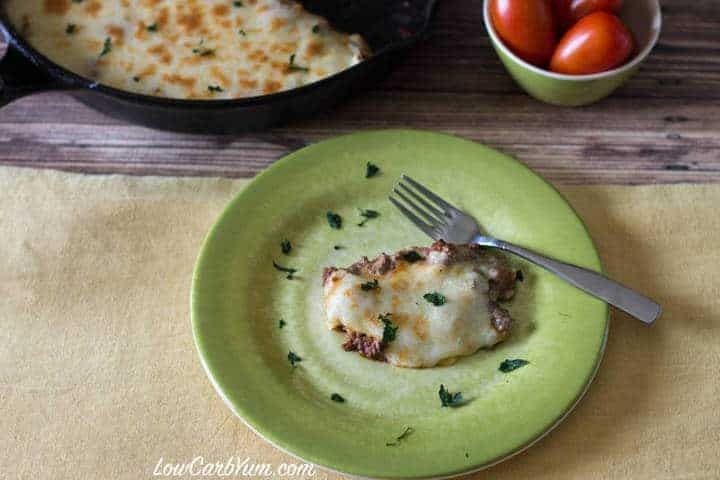 If you prefer cooking on the stove or grill in summer, try cooking low carb moussaka in a skillet for dinner. 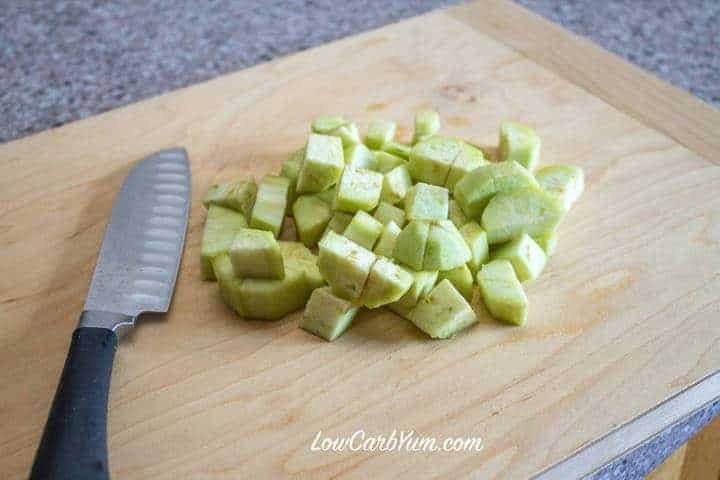 Peel and cut eggplant into diced chunks about 1/2 inch each. 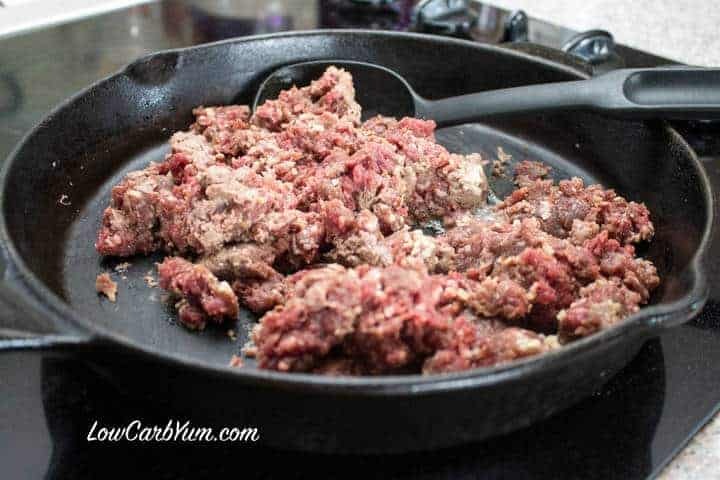 Brown beef with garlic in skillet; drain. Add eggplant, tomato paste, water, oregano, salt, onion powder, cinnamon, ground ginger, allspice, and pepper. Cook about 10 minutes or until eggplant is tender. Combine milk and egg in small bowl. Set aside. Melt butter in small saucepan. Add milk mixture. 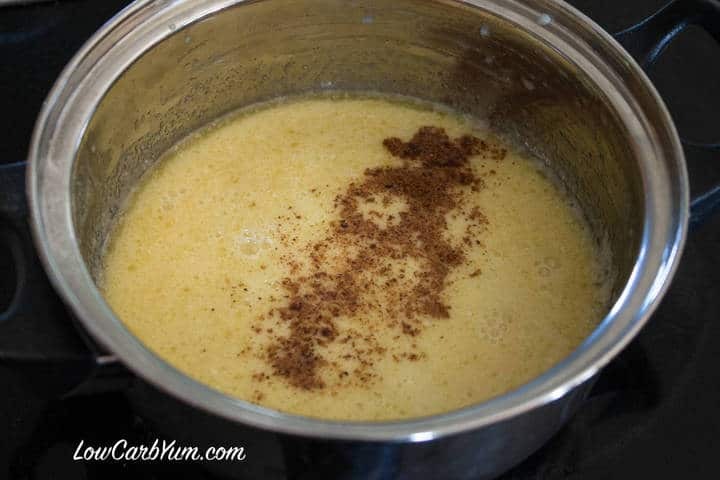 Cook over low heat stirring constantly until thickened (add xanthan gum if needed). Power white sauce over meat mixture. Top with cheese. Place skillet in oven about 6 inches from broiler and broil on high for 2-3 minutes or until cheese is browned. If you don't want to turn oven on, you can cover the skillet and just cook until the cheese melts. Sprinkle chopped parsley on top if desired. 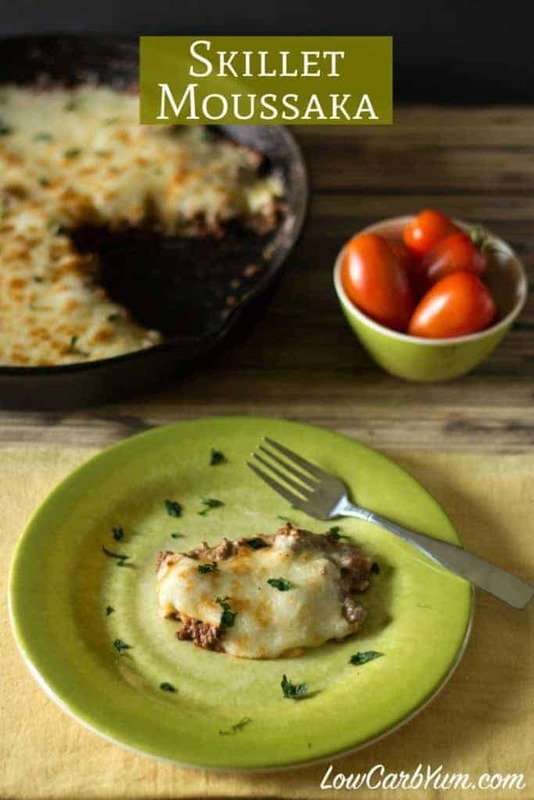 [post_content] => Have you ever tried a skillet moussaka recipe? 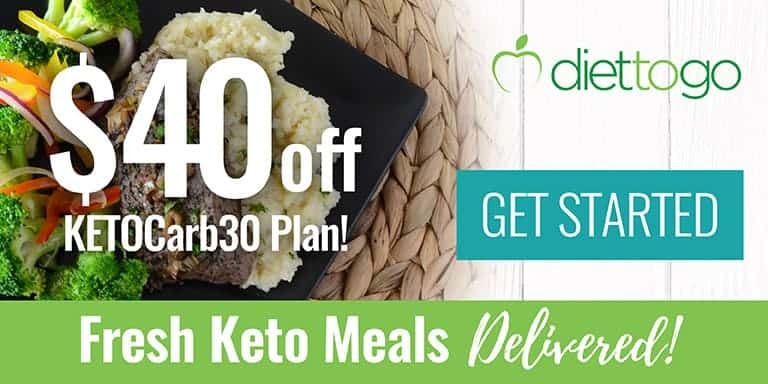 If you prefer cooking on the stove or grill in summer, try cooking low carb moussaka in a skillet for dinner.